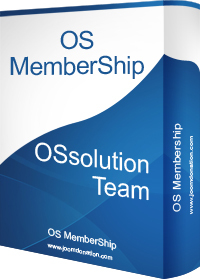 Membership Pro is a membership/subscription extension developed by Ossolution Team for Joomla 1.6, 1.7, 2.5 and 3.0. It allows you to create and sell subscription plans, let members subscribe for these plans and give them access to restricted resources (Documents, Menus, Modules, Pages...) on your Joomla site. Subscription Plans management: You can create and manage(list, edit, delete, update, publish, unpublish) subscription plans from back-end of your site. For each subscription plan, you can specify price (how much users have to pay to sign up), subscription length (how long the membership is active if users sign up for this plan), thumbnail, description.... of that plan. Recurring subscription: From version 1.1.0, Membership Pro allows you to create recurring subscription plan (for example, Weekly or Monthly or Yearly recurring subscription). When the subscription of one subscriber is expired, it will be renewed automatically. Please note that not all payment plugins support recurring subscription. At the moment, only Paypal and Authorize.net are supported. If you use a different payment plugin, you won't be able to use this recurring subscription option. Membership sign-up from front-end: When users visit your site, they will see list of publish subscription plans, choose a plan they want, sign up and process payment (via online payment gateways such as Paypal, Authorize.net, Eway, Offline Payment...). After that, they will have an active membership of that subscription plan and can access to restricted resources which you setup for each subscription plan. Renew 10 days , price 12$ . Renew 20 days, price 20$. Renew 30 days, price 28$... and so on. You can setup any number of renew options to meet the need of your system (very flexible). Auto Reminder feature : You can setup the system so that it will send notification email to subscribers X-Days and Y-Days before their membership expired so that they will know and process renew his membership. Coupon Code feature allows you to create coupon codes from back-end of the extension and send these coupon codes to your customers so that they get discount while subscribing for your subscription plans. Coupon code can give discount by amount or by percent of total subscription cost, can be used for one plan or for all subscription plans. Build-in Invoice support : Membership Pro allows you to config the extension so that when someone subscribe for a subscription plan, a PDF Invoice will be generated. The format (layout) of this invoice can be changed in Confguration of the extension. This PDF invoice can be sent to subscriber's email. Subscribers can also download this PDF invoice on subscription history page. Restrict access to Docman Documents: If you are using Docman on your site and want to restrict access to Docman Documents for Subscribers, you can use OS Membership Docman Plugin. The plugin allow you to setup your system so that when user sign-up for a subscription plan, they will be assigned to the corresponding Docman Groups so that they can download the documents restricted to subscribers of this subscription plan. When their membership expired, they will be removed from that Docman Groups automatically and they won't be able to access to the Documents anymore. Assign Subscribers to Joomla Groups when they sign up for a subscription plan (Joomla 1.6 and above version). By assign subscribers to Joomla Groups, you can use Joomla ACL feature to restrict access to any resources on your site (Joomla Articles, Joomla Menus, Joomla Modules, resources from custom extensions which support Joomla ACL...). This feature is provided by OS Membership Joomla Groups Plugin. Restrict access to part of Joomla article: Membership Pro has a content plugin which allows you to restrict access to part of content in a Joomla article to subscribers of certain subscription plans. When a user read an article which has text restricted, he will see a message tell them that they will have to be an active subscribers to see that text...(the message of course can be configurable). Restrict access to Pages on your site : You can use OS Membership URLs plugin to restrict access to any pages on your Joomla site for subscribers. Basically, the plugin allow you to enter URLs you want when you create a subscription plan and only subscribers of this subscription plan can access to these urls. Membership Plans content plugin allows displaying (all plans, plans from a category, certain plans) subscription plans in a Joomla article. ACYMailing plugin allows subscribe users into ACYMailing newsletter lists when they sign up for a subscription plan. You can then use ACYMailing to send newsletters to your subscribers. Captcha and Tax support . Subscription History : Subscribers can access subscription history page to see their subscription history, edit information of any subscription record or process renew / upgrade his subscription. CSV export feature allows you to export subscribers of a subscription plan (or all plans) into CSV file so that you can view it in an Excell program like MS Excell or exchange data with a different system. Syncronize data with Joomla Profile plugin : Joomla 2.5, 3.x has a plugin called User Profile which allows collecting more information like address, address2, phone....from users when they register for an account in your system. From version 1.5.2, Membershio Pro also adding support for this feature : When users sign up for a subscription plan, not only Name, Email of that user is updated to his Joomla account profile but also custom fields data like address , address2, phone, website... are also updated as well. Import Subscribers from a CSV file: From version 1.5.2, we added a new feature which allows you to import subscribers from a CSV file. This feature is usually needed if you migrate your subscribers from other system into Membership Pro. Multi-payment gateways support: OS Membership supports more than 20 different payment gateways. Paypal, Authorize.net, Eway, and Offline payment plugins come in the download package by default (you don't need to purchase these plugins). Other payment gateways like 2Checkout, Google Checkout…are released as separate plugins and you will need to purchase it if you want to use these extra plugins on your site. Build-in translation function allows you to edit any language strings in the extension from back-end of your site (don't have to open the language file in text editor and edit manually). User Registration Integration: Users can enter username and password on subscription form to register for a Joomla account on your site when they subscribe to a subscription plan (you can turn of this feature). When user subscribe to a subscription plan, his account will remain pending until his subscription become active (when he completed Payment or Admin active it manually). Auto fill-in registration form with data stored in user profile. Registration history plugin which allow registrants to see and edit all events which they registered. Access Support Forum to post your questions and get answered from us. 1. Post your questions on Forum . 2. Login to your account and submit a support ticket .